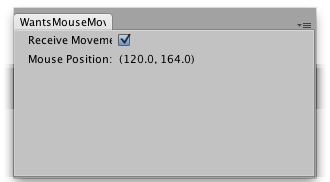 Checks whether MouseMove events are received in the GUI in this Editor window. If set to true, the window recieves an OnGUI call whenever the mouse is moved over the window. Note: This function does not trigger Repaint() Automatically. Editor Window that detects mouse moves when the toggle button is activated and the mouse is over the window. // mouse over the window will be reported. // "Mouse Position" shows where the mouse is outside of the window.